STEED, Thomas Jefferson, a Representative from Oklahoma; born on a farm near Rising Star, Eastland County, Tex., March 2, 1904; attended the public schools of Konawa, Okla.; connected with Oklahoma daily newspapers for twenty years, including four years as managing editor of Shawnee News and Star; enlisted on October 29, 1942, as a private in Antiaircraft Artillery and released from active duty in May 1944 with rank of second lieutenant; joined Office of War Information July 1, 1944, and served with information division in India-Burma Theater until December 1945; elected as a Democrat to the Eighty-first and to the fifteen succeeding Congresses (January 3, 1949-January 3, 1981); chairman, Committee on Small Business (Ninety-fourth Congress); was not a candidate for reelection in 1980 to the Ninety-seventh Congress; was a resident of Shawnee, Okla., until his death on June 8, 1983; interment at Resthaven Cemetery, Shawnee, Okla.
Ralph Nader Congress Project. 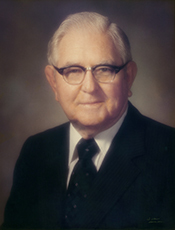 Citizens Look at Congress: Tom Steed, Democratic Representative from Oklahoma. Washington, D. C.: Grossman Publishers, 1972.